Chandelier lighting brings an element of dreaminess to clinical lighting and adds a mystical allure to any space. At Fabiia, we are here to infuse that infectious charm to lighting solutions with our collection of Chandelier including LED chandelier, black chandelier, modern chandeliers, bedroom chandeliers and others. Our well curated collection of chandelier lighting luminaries will brighten up your interiors, leaving you satisfied and yet craving for more! Chandelier lighting has been in vogue since a long time. From traditional designs, using candles, to their modern contemporary avatars, chandeliers add light and drama to any space. While lighting is the most essential element of a room, the right choice of lighting fixtures can set the tone of any living space. Chandelier like LED chandelier, black chandelier, modern chandeliers, bedroom chandeliers bridge the gap between style and functionality effortlessly and beautifully transform the look of any room. At Fabiia, we add a special touch of brightness to your space by way of bespoke variations in some of the chandelier lights. The 4 Drop pendant chandelier light, for instance, is a lovely bespoke creation in hand blown glass that comes, hold your breath, in 21 colour options! Adjustable height, in accordance to your need, is reason enough to seal the deal, right?! Or try the Acid chandelier light, a veritable vision in yellow! These chandelier lights can redefine home interiors and commercial spaces such as cafes, hotels or restaurants with finesse. At Fabiia, chandelier lights including LED chandelier, black chandelier, modern chandeliers, bedroom chandeliers span a range of styles, from art deco and classic to retro and mid century modern. Chandelier lights add a touch of drama to a space. What better way to introduce that element with flourish than Atomic pendant light? A beautiful black chandelier, available in other colours as well, it epitomises period drama in a delightfully chaotic design. Chandelier lights like LED chandelier, black chandelier, modern chandeliers, bedroom chandeliers are not limited to enclosed spaces. Think foyers and hotel entrances, passageways and intimate cafes. It can enliven any interior and make even a utility area look special. It is said that lights are the last thing a person notices when walking into a room. Chandelier lights like LED chandelier, black chandelier, modern chandeliers, bedroom chandeliers can definitely change that perception. 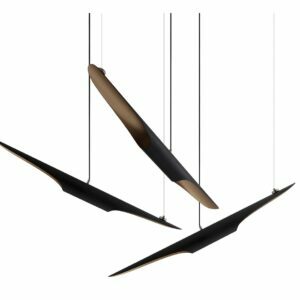 Install the musically inspired Bruebeck or Botti Chandelier lights and watch those heads turn up in ecstasy! The Burj Chandelier light is a fitting tribute to the architectural genius of Burj Khalifa and a delicious representation of modern chandeliers. At Fabiia, the collection of chandelier lights including LED chandelier, black chandelier, modern chandeliers, bedroom chandeliers are available in incandescent, fluorescent and even LED lighting. Wonderful variety to choose from! LED chandelier lights are in fact a blessed marriage of style and modern sensibility, taking care of electricity bills too. Several customizable features enhance the appeal of our chandelier lights. Do check out the Carina or Coltrane chandeliers as also others for customer specified features. Chandelier lights from our range notably LED chandelier, black chandelier, modern chandeliers, bedroom chandeliers and others come in a plethora of materials and a riot of colours! You can adorn your interiors with gay abandon; all you need is the glow of chandelier lights to highlight your aesthetic sensibility to its fullest potential. Tell us who wouldn’t want to be under the spell of Hypnotic Chandelier light? Or maybe bask in the opulence of Saki or Waterfall chandelier lights? Indeed, the whole collection of Chandelier lights including LED chandelier, black chandelier, modern chandeliers, bedroom chandeliers will bathe you in the afterglow of bliss!